Okaya Kōgaku Kikai K.K. (岡谷光学機械㈱, meaning Okaya Optical Works Company, Ltd.) was a Japanese maker of leaf-shutter 35mm cameras (as well as "Vista" brand binoculars) in the 1950s. Okaya was based in Nagano. 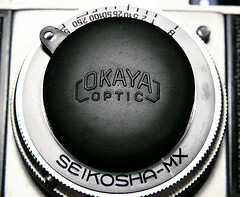 Okaya's cameras were distributed within Japan by Hattori Tokei-ten. Their brand name was Lord — a name that was probably owned by Hattori and was already used in 1937–8 by Tōkyō Kōgaku. Lord cameras have Okaya Highkor lenses. 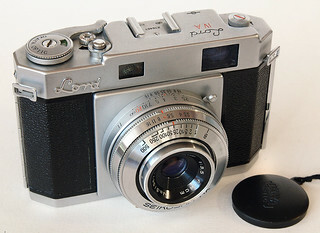 The earliest Lord 35 is a viewfinder camera; all subsequent Lord cameras have rangefinders. The last models have exposure meters. Okaya's technical innovations (at least for Japanese cameras) included a rewind button that only needed to be depressed at the start rather than all the way through the film (Lord 35, 1953), a folding rewind crank (Lord IVB, 1955), a baseplate port for a mechanical winder (Lord SE, 1958) and photocells around the front of the lens and thus under any filter (Lord Martian, 1960). ↑ Tōkyō Kōgaku was a dependent company of Hattori at the time. ↑ The Japanese Historical Camera, 2nd ed. (Tokyo: JCII Camera Museum, 2004), pp.68, 81, and 103 respectively. Asahi Camera (アサヒカメラ) editorial staff. Shōwa 10–40nen kōkoku ni miru kokusan kamera no rekishi (昭和10–40年広告にみる国産カメラの歴史, Japanese camera history as seen in advertisements, 1935–1965). Tokyo: Asahi Shinbunsha, 1994. ISBN 4-02-330312-7. Items 1043–5, 1822–8. This page was last edited on 19 December 2017, at 11:39.